Click to view the NHN pdf Brochure in a new tab. The new NHN 80V Series offers a comprehensive range of hydraulic, power adjustable door closers to suit all applications. Incorporating the latest engineering technology NHN 80V Series provides three power adjustable (by allen key) door closers. Successfully awarded EN1154, EN1634-1 and Certifications, the NHN 80V Series is backed up with a 10 years No Quibble* guarantee. Standard Square Body with Cover & Accessories. Three body sizes will cover full door size requirements and applications. Closing Force – Power adjustable by spring to EN1154 size 2-4 for 83v, size 3-6 for 85v and size 6-7 for 87v. The position indicated by figure ‘A’ is the standard postion of the eccentric shoe. By turning the show 180° the position shown in figure ‘B’, the door closing force increases about 25% just before the door closes (during last 10°). This function increases the door closing speed in the last 0 – 2° before the fully closed position, ensuring quick and complete door closure. This function is most useful with an airtight door or with a door with a tight latch. The latch angle is factory set at 0°, turn the link counter-clockwise about 4 turns (this extends the link) and a latch angle of 2° is obtained. If a gust of wind or other strong force hits the door in the opening direction, it can damage the wall or cause injury to people. The back-check function works within the door opening range 70° – 85° to 180°. The back-check power can be adjusted with the back-check valve. The delayed door closing action takes effect all the way from 180° – 85°. door opening. The closing area can be adjusted with the delay closing valve. The maximum closing time from 180° opening to 85° is 90sec. when the delay valve is fully screwed in. NHN 83V | Regular Arm Door Closer for OPEN-IN Doors. 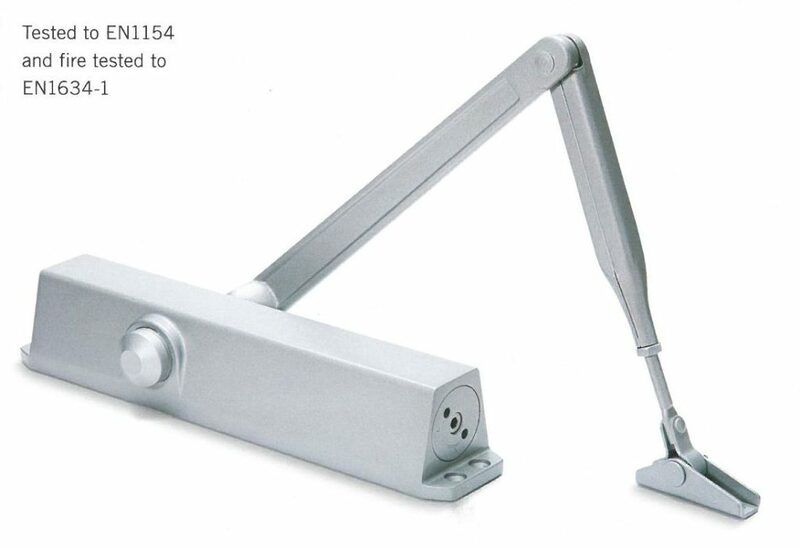 NHN 183V | Regular Arm Door Closer with Hold-Open Arm for OPEN-IN Doors. NHN 183V PA-1 | Parallel Arm Door Closer with Hold-Open Arm for OPEN-OUT Doors. 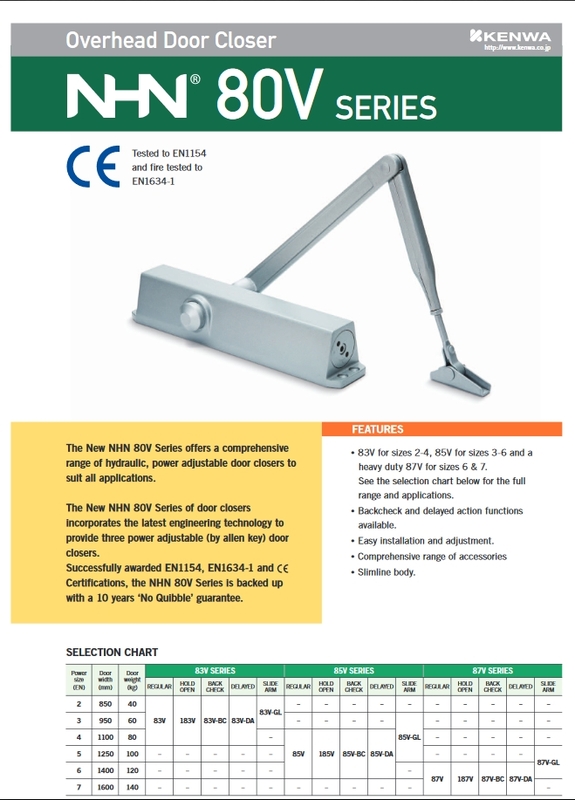 NHN 83V GL | Slide Arm Door Closer. NHN 85V | Regular Arm Door Closer for OPEN-IN Doors. NHN 85V PA-1 | Parallel Arm Door Closer for OPEN-OUT Doors. NHN 185V | Regular Arm Door Closer for OPEN-IN Doors. NHN 185V PA-1 | Parallel Arm Door Closer for OPEN-OUT Doors. NHN 85V GL | Slide Arm Door Closer for OPEN-IN and OPEN-OUT Doors. NHN 87V | Regular Arm Door Closer for OPEN-IN Doors. NHN 87V PA-1 | Parallel Arm Door Closer for OPEN-OUT Doors. NHN 187V | Regular Arm Door Closer for OPEN-IN Doors. NHN 187V PA-1 | Parallel Arm Door Closer for OPEN-OUT Doors. NHN 87V GL | Slide Arm Door Closer.